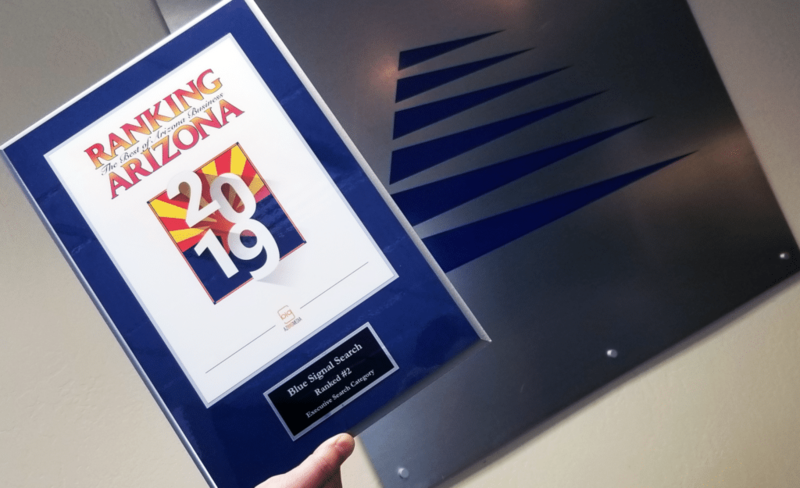 Blue Signal was recently awarded #2 Executive Search Firm of Arizona for 2019! “Ranking Arizona - The Best of Arizona Business” is an annual publication by AZ Big Media that is Arizona’s largest business opinion poll. It annually ranks companies based on the opinions of clients, partners, and customers. This accomplishment is huge for Blue Signal, as we were up against the best in the business, and as first-time listers, we had a lot to prove! We are so humbled and grateful for our amazing clients, candidates, partners, and other professional support for the recognition. We take pride in our services,and are excited to hear that we have helped so many! AZ Big Media has been reporting compelling business and lifestyle news for Arizona for over 30 years. They cover everything from breaking business, to real estate news, to lifestyle features, professional tools, event information, and even magazine articles. To learn more about their print and online publications, visit their site here. Blue Signal was founded in Chicago in 2012, and since then, has grown into a multimillion-dollar executive placement firm with offices in the Phoenix and Chicago areas. Blue Signal has established itself as the premier executive search firm within wireless/telecom, technology, and related industry niches. At Blue Signal, we believe hiring the right people is the best way to transform business. Our targeted, specialized searches deliver highly qualified professionals to meet every hiring need. Our team has decades of combined experience in finding the right people for each unique company culture and industry niche. Our team works with both candidates and hiring managers to find the right fit. Contact us today to let us know how we can help.